It inspired me to do my take on her idea and to finish off this year with a brain storm of all the thoughts, inspirations, ideas, intentions, goals and wishes I have for my artwork moving forward and write them individually on a piece of paper and put them in a jar. 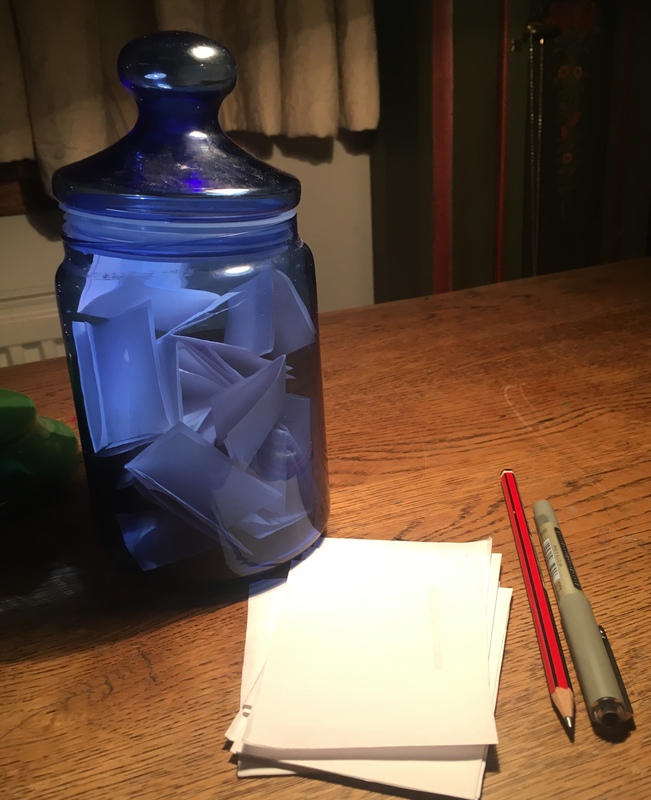 As my blue glass jar filled up I wondered if it would be empty next year or in fact be twice as full as ideas do seem to inspire more ideas! However for me the main benefit of this magic jar is to get all my ideas stored in one place. I have a tendency to write ideas on scraps of paper or in different note books or on my phone, but collating everything in this way in a physical place feels really helpful and very heart pleasing. It doesn’t so much feel like a ‘to do’ list or a bucket list but more a kind of sweetie jar of passion or a cauldron of possibilities and a beacon drawing me forward into the new year. Wishing you much love and happy creativity as the year comes to an end.